Don’t Stay On This Escalator! | "It Is Finished!" To look around and compare ourselves with others, we might get the idea that things are just fine as they are. But are they? Suppose we discovered we were born on a spiritual “down escalator,” and are destined for a very rude awakening at the bottom? Is life just going to “work itself out” spiritually? Or is there something we must do, decisively and without delay? Could it be that things aren’t as they seem and great peril lies ahead? People aboard the Titanic were snug in the knowledge that they were on the greatest ship ever built and under the control of a world-class crew of expert seamen. The same sense of safety and security pervades much of the modern industrial world, particularly in the USA. Our creature comforts, science and technology have lulled us into believing all is comparatively well with our lives. So why did Jesus Christ warn us so sternly that we are not as safe as we think and unless we take resolute action to remedy our condition, destruction lies just ahead in the dark? Lifeboats have been provided, but we must find them and get in them before it’s too late. As the great ship Titanic plied through the icy waters of the North Atlantic, bright lights and festive music split the late night air, and most of the passengers had a strong sense of security in the knowledge that this magnificent ship was one of man’s greatest achievements. “Unsinkable” and complete with all the comforts of home, she was going to her doom without the slightest hint of danger. The band played on, the crew turned in, waiters cleaned up and bartenders polished glasses. Passengers on deck shared their dreams for the future, not knowing what was lurking just ahead in the dark. Most respondents to our hypothetical survey would take comfort in the fact that they are “better than most,” and “not nearly as bad as criminals, mass murderers, or just plain mean people.” Looking around them, life would seem to be pretty much a here-and-now proposition. They go to bed each night believing that the next day will be pretty much like the last. Surrounded by the creature comforts and endless entertainment that recent industrial and scientific progress has produced, they are unknowingly anesthetized into a sense of security that man rules, controls, and determines his own life and the hereafter as well. In the verse above, Jesus issued both an invitation and a warning: The invitation, “…the way is narrow that leads to life, and few are those who find it.” And the warning, “…and the way is broad that leads to destruction, and many are those who enter by it.” The warning suggests that most people on earth are on the “broad” path to destruction, and that only a few will find the “narrow” path to eternal life. The gate is wide. There is plenty of room for everyone; small wonder, because it has to carry heavy traffic. Many people are on this “broad way.” There is plenty of company on it. In fact, every living creature from Adam to the end of time will have been on it at one point or another. People don’t have to do anything to get on it. They are born on it, everyone is. They do not have to search for it. People don’t have to do anything to stay on it. All they have to do is just keep riding. No effort required. It is mostly comfortable, fun, and interesting on this “down escalator.” There is plenty of company and everyone seems to be having a good time and very importantly, it’s very popular and “in” to be on it. One must get off the escalator to avoid destruction. All who remain on it are doomed. A positive and decisive act of will is required. There is “a gate” off the escalator. First of all, just a comparative few ever find this road. The problem is solvable, there is a way off. No one has to perish. One must enter through this gate. This involves a definite act of will. 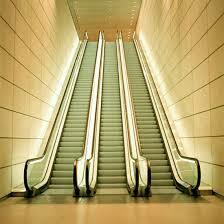 Our wills were not involved when we were born on the “down escalator;” that happened without our knowledge or choice. All who are willing must consciously choose to enter this gate. The gate is small. It takes some searching. One must be looking for it. This gate is low, requiring all who enter to bow down humbly, not strut through proudly. Because it is small, a person cannot carry anything with them. One’s life possessions buy nothing here, all must be left behind–we come this way alone and empty-handed. The gate leads to a narrow way. The crowds are much thinner here. Traffic is light and the road is narrow. Because it is narrow, this way must be traveled one at a time. It is an individual decision to enter and to travel this road. No one is taking another person with them. Belonging to a church or religion buys nothing here. Because one’s parents were “Christian” or they were baptized as a child, or born in a “Christian” country is immaterial along this way. This road leads to life. To eternal life, the kind of life that only God has. The Greek word used here is “Zoe”, that is life in itself. All “escalator-dwellers” have life too, but it is “Bios” life, that is, derived life having no essence in itself, and destined to expire at death. Just a comparative few ever find this road. Gone is the popularity we once knew, this is a road that is quite literally, much less traveled. We have to find this road. We must search for it–it is not stumbled upon. We must want to find it and set our sights on continuing the quest until we do. We have to leave one way to get on the other. There is no straddling both ways at the same time. The escalator must be abandoned before we can get on the road that leads to life. 2. Those running down the escalator. These people are “grabbing all the gusto” they can get out of life. They’ve decided they don’t care about God, eternity, or any form of accountability. They’re in this thing to get all the fun and enjoyment they can, sometimes resorting to outright lawlessness and crime to accomplish their objectives. 3. Those running up the escalator. These are the “religious,” or “moral” people. They are sweating their way upward, hoping that by running fast enough they can avoid what they perceive as an uncertain future at the bottom of the escalator. These people are awake to spiritual things, and have adopted one system of religion or another to reach up and please God (whoever they perceive Him to be) and one another. One common characteristic of all who choose to remain “escalator-dwellers” is that they are all going to destruction regardless of which class they are in. This “broad way” is a “spiritual emporium” with room for any combination of religious, agnostic, or atheistic people. It is easier to understand the destiny of those in the first two classes, but religious people too? In some sense, those who say “all religions lead to the same place” are correct. But the place is sure destruction! Which would you rather be, “not judged,” or “judged already?” We are all born “judged already,” it is our solemn personal responsibility to take the action necessary to become “not judged.” John the Baptist could not have put it clearer, the central issue is what we choose to do about the Son of God, Jesus Christ…”He who believes in the Son has eternal life; but he who does not obey the Son shall not see life, but the wrath of God abides on him.” John 3:36. Jesus Christ never called anyone to a cause, program, or membership in one church or another. He called us to Himself for He knew there was safety there, and nowhere else. The Shepherd, who laid His life down for them, called His Sheep home then and He does so now. “And there is salvation in no one else; for there is no other name under heaven that has been given among men, by which we must be saved.” Acts 4:12. How about you? Will you take your chances on the “escalator,” or choose to get off and embark on the “road less traveled?” Most thinking people would be unwilling to accept the kind of risk involved with staying on such an “escalator” in any other area of their lives. They would never take such chances with their health insurance, life insurance, or even in maintaining their car! If we are so diligent in temporal matters, why do we insist on turning into wild-eyed Las Vegas gamblers when it comes to our eternal destinies? Will you insult the kindness and grace of God, with what He calls “the filthy rags” of your own “good life”, or “good deeds?” Or will you receive His free gift, His only begotten Son, who “emptied Himself, taking the form of a bond-servant, and being made in the likeness of men…humbled Himself by becoming obedient to the point of death, even death on a cross.” Philippians 2:7-8. If He was willing to humble Himself, and take a road of pain, rejection, and eventually death on our behalf, who among us would be so proud as to ignore the only way* He provided to get off this path to sure destruction? * For more on this “only way He has provided,” please see our paper entitled “Heaven’s Coin Of The Realm” dated September 5, 2013. This is why human beings are often referred to as “mortal.” In its original language, “mortal” literally meant “death doomed.” From the moment of our conception forward, we must face death sooner or later. The Bible explains that this was the most severe consequence of Adam and Eve’s sin against God–they unknowingly introduced the presence of death into God’s perfect and death-free original creation. “Religion” in this context is defined as all collective attempts by man to “reach” God by whatever means. While religion can take many forms, it shares the common characteristic that man’s efforts “works” are at its heart. This is directly opposed to the notion of a relationship with God through faith in the efforts of another Person on their behalf, which is received as a free gift quite apart from any “works” at all. Rather than man reaching up to God (religion), this is God reaching down to man (relationship). Surely one of the most misunderstood words in the Bible, “grace” is not really a religious term at all. Grace is not some mystical cloud that descends on us, or something that is given to us as a result of a good deed which we have done. Grace is simply God’s attitude toward us based on the work that His son, Jesus Christ performed on our behalf. Romans 5:1-2 declares, “…we have peace with God through our Lord Jesus Christ, through whom also we have obtained our introduction by faith into this grace in which we stand…” God has no problem with us, it is we who have a problem with Him. He has been reconciled to us [by the death of His Son], now it is us that must be reconciled with Him. To borrow a line from United Airlines advertisements, we dwell under “friendly skies.” God’s attitude is one of gracious acceptance and total forgiveness, IF we will come to Him on His terms, not ours.